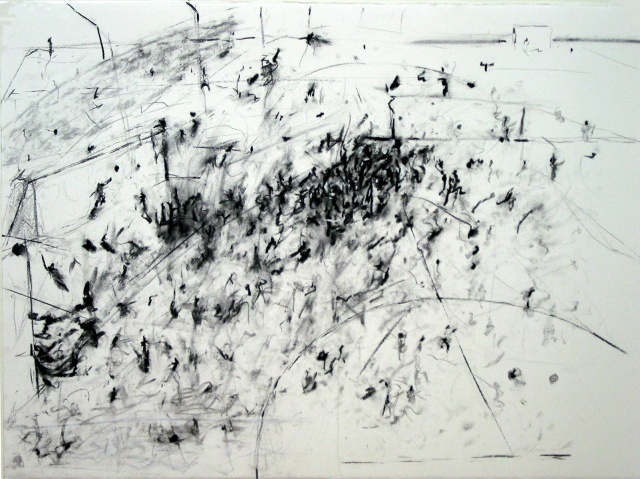 It Draws Me is a wall installation where I approached drawing as a soccer fan. I videotaped myself sitting in front of a TV and drawing the final soccer game Peru was playing in the 2004 South American Cup. Being physically pulled in by the crowd’s chants and the excitement of victory or elimination, I created two drawings (one for each half of the 90-minute game). I arranged the drawings and video by mounting them on a piece of Astroturf that is secured to the wall. The video is presented in a split screen. On the right side footage of me drawing from the first half and on the left side footage from the second half. Corresponding with the video are the drawings on either side. The Astroturf, functioning as a base, references a soccer field. The overall piece explores the collective exhilaration in sports and the fanatic obsession of the fan.